Spoiler Alert: The following, as you may assume, reveals the outcome of Netflix cooking competition show The Final Table. If you don’t want that spoiled, feel free to go binge the series and then come back and read on. 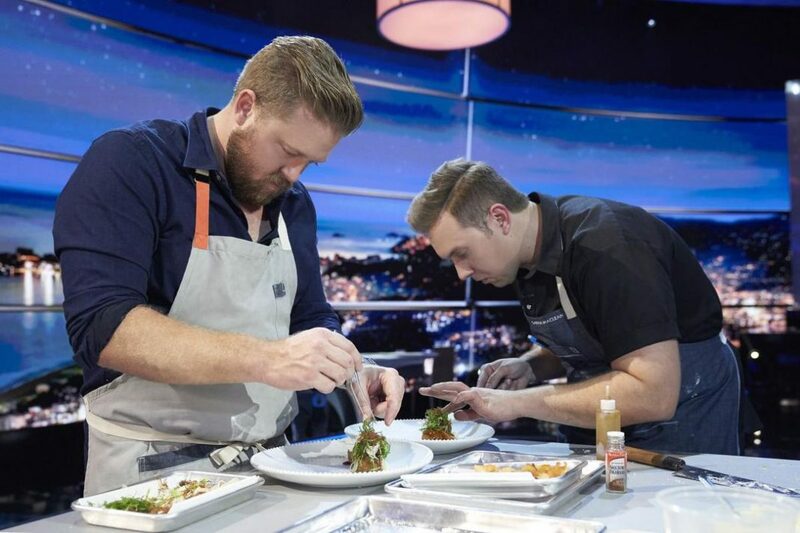 With all the dramatic lighting and dun-dun-dun music we’ve been taught to expect some three decades into the modern era of reality television, Los Angeles chef Timothy Hollingsworth was declared the winner of The Final Table, Netflix’s recent entry into the cooking competition genre. He wowed the final panel of judges with a perfectly executed dish taken from an early version of the menu at his excellent downtown restaurant Otium. Hollingsworth–who also operates C.J. Boyd’s Fried Chicken and Free Play at new L.A. food hall the Fields and previously partnered with Bill Chait on Barrel & Ashes–cooked his way through ten episodes to take home the win, nine of them as part of a two-person team with Canadian chef Darren MacLean. For each of those nine initial episodes, the chef contestants, who hailed from locations around the world, were presented with a specific national cuisine to prepare for judges from that country. The show highlights Mexico, Spain, the United Kingdom, Brazil, India, the United States, Italy, Japan, and France. While host Andrew Knowlton from Bon Appetit insists on saying at the end of each episode that the cast is “going” to each destination, the entire series was in fact filmed at a Sony studio in Culver City in December, 2017. On Top Chef, a winner walks away with increased celebrity from the television appearance plus a check for around $125,000. Those prizes can help a striving young chef finally open their own restaurant or hop from the B-list to becoming a big name in their hometown. Almost all of the 24 competitors on Final Table, however, are already head chefs of one, if not multiple restaurants, many of them lauded with Michelin stars and other impressive accolades. The only prize that is ever mentioned on air is that the winner will get to sit at the titular “final table,” establishing themselves, at least within the mythology of the show, as a peer to the prestigious chefs from each country who have been brought in to judge their work. Chef Hollingsworth started his career washing dishes in a French restaurant in Placerville, California, where he fell in love with kitchen life. He dreamed of working for Thomas Keller, which he accomplished in 2001, starting as a commis at the French Laundry, then helping open Keller’s New York restaurant Per Se. Hollingsworth returned to the French Laundry, where he was promoted to sous chef in 2005, then chef de cuisine in 2009. The name French Laundry is dropped often on Final Table, and the producers seem to take for granted that the show’s audience is familiar with the three-Michelin-starred institution, though it is hard to imagine that a great percentage of those viewers have actually eaten there. Located in Yountville, California, it’s about an hour’s drive north of San Francisco, and at just 60 seats, they’re not feeding a lot of customers per night. And there’s the cost, which hovers around $325 per person. Keller is well-known as an advocate for European, specifically French, culinary tradition. He co-founded a program specifically to help American chefs train to compete at the Bocuse d’Or World Competition, a prestigious cooking competition in Lyon, France. Hollingsworth was one of the foundation’s first beneficiaries. Keller’s co-founder in the project, Daniel Boulud, is the employer of another Final Table contestant, Aaron Bludorn. Classical French cuisine remains a global standard for a certain idea of excellence. Final Table mirrors this by setting up the French judge as the final cuisine challenge to determine which chefs will make it to the last round. Entering that competition along with Hollingsworth and MacLean and the other chefs are the team of Esdras Ochoa and Rafa Gil. Ochoa will be familiar to Los Angeles diners from his local restaurants Mexicali Taco and Salazar, which he launched before moving to Hong Kong in 2017 to open rustic Mexican restaurant 11 Westside. Born in Mexico before emigrating to California as a kid, Ochoa learned to cook from his family, and started his ascent to global superstardom by opening a taco stand in a downtown L.A. parking lot. Throughout Final Table, he leaned on his contemporary interpretations of Mexican and Latin American flavors for a variety of challenges, but what he and his Brazilian-born partner Rafa Gil—who has helmed kitchens in Singapore, Hong Kong, and Jakarta—presented in episode nine failed to impress the French judge, chef Anne-Sophie Pic. Pic is one of just 16 women who received stars in the 2018 Michelin Guide to France, out of 621 restaurants awarded the honor. “France has long enshrined the practice in which women cook at home for the family while men acquire fame and wealth as chefs in famous restaurants,” the New York Times reported when the most recent guide was published. The lack of representation of female chefs and chefs of color is particularly visible in Michelin’s rankings of France, but the issue is by no means isolated to that country. In New York City, female chefs make up only 8 percent of star-holders. The stars are geographically biased, as well. There simply is no Michelin guide to Mexico, to almost anywhere in South America, nor to any city or country in Africa. Nor, it should be noted, is there a Michelin guide to Los Angeles. And, while there have been many calls to bring the guide back here, one wonders if the lack of an old world authority figure dolling out stars might actually have helped encourage a vibrant, innovative food scene that celebrates diverse food culture. The producers of Final Table appear to have made some effort to include female chefs as judges; of the nine, three are women. Of the 24 competitors, however, there were only five women, three on mixed-gender teams, and one team of two women. In the final round the judges are presented with options of four white men–an American, a Canadian, and two Australians. They are probably all extremely gifted, hard-working, and extremely deserving individuals. But they are also, in their careers outside the show and within its confines, all the beneficiaries of social forces that perpetuate the elevation of certain kinds of chefs and leave others–particularly female chefs, chefs of color, and chefs representing heritage cuisines outside the European canon–with a more difficult struggle for acceptance and success. Final Table might have produced around this, creating a more diverse contestant pool or setting up challenges in ways that would play to the strengths of different cuisines, but in a way, the fact that they did not offers viewers something more meaningful than the typical reality show. It’s a reminder that, while food media–and food eaters–might increasingly celebrate street food, there is still another world of gate-keepers who keep the old, exclusive ways alive. Next articleWho Was that Get-Rich-Quick Guy Who Used to Advertise in L.A.?